Some of y’all have been helping me to celebrate a not-so-little piece of work that was published last week, and I truly appreciate the enthusiasm for the manuscript and what it means for our understanding of mentoring in academic surgery. When I posted that this work was a labor of love for me I meant it; I started looking into questions around mentoring in surgery when I was a resident through my ASE SERF project. At that time, what I really wanted to do was a qualitative project that would help us better understand what mentoring should look like. Alas, 16 year ago I had neither the resources, the time, the know-how, or the patience to do this. I’m still proud of the work we generated that year but it wasn’t what I really wanted as my major contribution in this area. So, fast forward to 2014 (yeah, I know, that’s a long fast forward). I started on one of my curiosity/ passion projects, intending to expand upon work we’ve done describing barriers to careers in academic surgery. Again, the first pass was survey based and more quantitative, and just like the original mentors work I worried that something was getting lost in translation. I believe in the power of story, I had learned quite a bit about grounded theory method through our professionalism work, and I had a couple of VERY willing accomplices who are also patient when projects take a while. In this case, “a while” means 3 1/2 years from Interview #1 to online publication of the first manuscript from the project. The interviews that I started in January, 2014, and that extended over the course of the next 16 months were intended to illuminate the barriers to careers in academic surgery. I believe they’ve done that, and the barriers manuscript associated with it is in the works. However, I realized about 6 interviews in that I was going to have the stories to write the mentoring paper that I wanted to write in 2001-2002; mentoring was raised as a critical factor in every single interview about career barriers, and this happened without any nudge from the interviewer. Of course, once the interviews were done my collaborators and I spent a few months working out our conceptual model, and once that was done there was manuscript submission, revisions, more revisions followed by rejection, selection of a new journal, resubmission, revisions, then acceptance. Submitting this manuscript was arguably one of the hardest things I have done; in truth it was harder emotionally than submitting my professional paper in graduate school was, primarily because of the level of personal investment I have in this topic. Mentorship is something I am passionate about, it’s something I think is incredibly important (thanks to the interviewees who confirmed my bias! ), and I love the work that Leigh and Will and I generated about it. When you send a manuscript like this one out you want everyone to love it as much as you do, even though you know that’s probably not what will actually happen. That rejection HURT, particularly because of how long it took to get there after trying really hard. Perhaps it reminded me a bit too much of my last bad boyfriend. Now that I’ve channeled my own inner toddler, I’m willing to bet I just channeled a few of your inner toddlers as well. What is it I don’t want to do? Admit it, you might have cringed a little when you read that word. It’s something that’s foisted upon us as a necessary evil in career development. And it’s something that makes many of us feel…well, icky, for lack of a more professional word. Certainly there are a group of people for whom networking comes naturally; the are able to dive in and meet people and find ways to connect to them. For the rest of us, networking is a more deliberate process, and one in which to keep our integrity we also need a way to remain authentic. If you want a quick fix, here’s an HBR article on learning to love networking that has four key steps. I want to focus primarily on the idea of finding a common interest (which I also associate with help-seeking), one of them that’s quite easily controllable and that creates a specific type of culture. Think for a moment about someone you know who is an amazing connector (I’m going to use that word to remove any negative connotations). That person who seems to know everyone, and whom everyone seems to know, and that familiarity is consistently in a positive sense. Chances are that person will in some way align with Adam Grant’s definition of a “giver,” which may be a secret to getting ahead, and certainly fosters a specific type of positive culture. Where am I taking this? I’m trying to move us from the idea of networking being transactional, because that seems to be when we get that dirty feeling about it. What if we thought about networking in a purely relational sense? What if we sought things that we have in common, and we asked questions and actually listened to the answers? To quote from Eric Barker‘s recent book, what if we shared our Twinkies by finding small ways to help one another? One more tangentially related thought: if you have friends you haven’t connected with recently, take this as a reminder that it’s time. I’ve not once regretted the coffee date, the run, the weekend when I’ve made time for it. 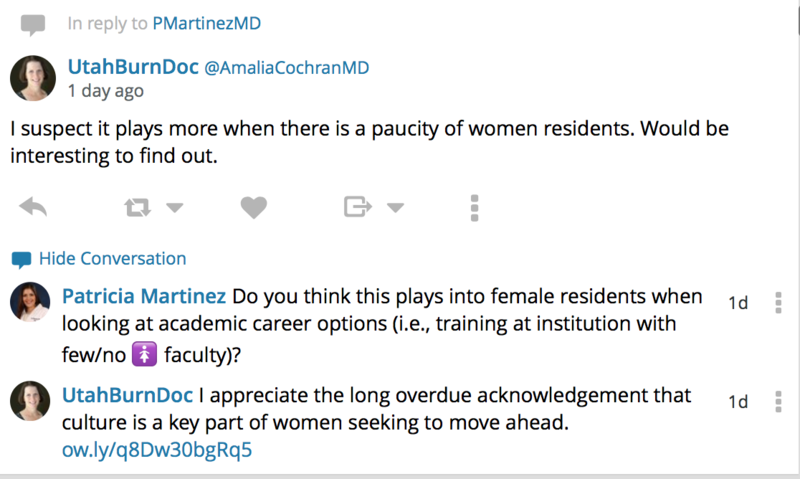 Some of you may be aware that I’m about three years into a two year project** examining barriers to careers in academic surgery; in its current form, the project focuses on women in academic surgery. In what isn’t likely to be a spoiler alert, while some gender-specific factors are identified, the preponderance of what we’re seeing is both systemic and cultural, therefore impacting the pipeline in general, not just for women. The major gap in the information that we have to date involves hearing the stories of those who choose to leave academic surgery. I’m aware of this limitation and have plans to address it, which means that this Sunday Review from the New York Times struck a special chord with me. The glass ceiling is real in business and in academia, and while the need to fix it is widely acknowledged, we still don’t entirely understand its etiology. What we do know is that theoretically it should be less of a pipeline problem than it was 20 years ago. In spite of more women entering surgical training, a recent study shows that gender parity in academic surgery will not happen in my lifetime. Advice on how to get ahead, while well-meaning, doesn’t serve to fix the deeply embedded cultural issues. 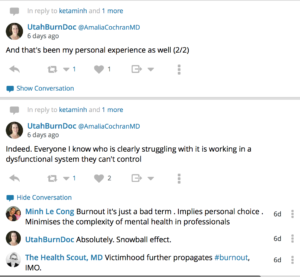 Preaching to already high-achieving women about how to fix themselves is likely too little, too late, and engages to a degree in the “victim blaming” I’ve been known to rail against when discussing burnout. Interestingly, there’s a tie between the loneliness described by the high-achieving women in the Sunday Review and burnout. While the basis for loneliness is complex and is only in part attributable to a sense of “other-ness” in those who aren’t historically represented in leadership roles, it quickly becomes obvious that it plays a substantial role in burnout…burnout can result in exit…exit results in loss of (diverse) talent…you can see the downstream effects here. I’m offering myself some thought challenges that I want to extend to each of you (yes, you, as you say, “I’m not a leader!”). What if today you tried today to bring more compassion to your team through a kind word or supportive act? Hint: “Thank you” counts as a kind word. If you can be specific in that thanks, it’s doubly valuable. What if today you worked to get someone connected into a network of some sort? Confession: being a “connector” is one of my FAVORITE things to do! What if today you helped someone celebrate a “win,” no matter how small that win feels- or if you celebrated your own? If you’re on Twitter, please share your own with #WednesdayWins. We need for this to become a “thing” to remind ourselves of what’s going well. **Not actually joking about the time line. Anyone who has experienced the joy and misery of qualitative research and grounded theory understands exactly what’s going on here. Did it actually kill the cat? Although my wheelhouse at this point in my life is obviously medical education, I follow several Facebook pages that are more generally about education. Two of my favorites are Edutopia and MindShift; both routinely post information and ideas that are easily extended to the world of med ed and surgical education. This morning MindShift linked to a piece that’s a couple of years old, and that I honestly didn’t see the first time by; fortunately, my own curiosity was piqued to go read about what’s going on inside the brain of a curious child. And, of course, I got unduly excited about the idea of using curiosity as a guidepost for learning activities. When I complete resident and student evaluations, one of the highest compliments that I give is when I describe someone as curious. Let’s start from the perspective of the life-long learner. Why do we keep learning things or asking questions? I would argue that it’s because we are innately curious. Several of us on Twitter today were using #alwayslearning to describe what “residency” year we’re starting today (PGY-20 for me, if you’re wondering); to a person, the folks I saw participating in this are people I know to be inherently curious people who are not intimidated by the idea of not knowing everything all of the time. They’re people whom I consistently see asking thoughtful questions and providing helpful answers on social media, and they are physicians who engage across specialties and interests. This, in particular, is an area in which I see a positive use of social media. If we’re in a state of curiosity, we get a nice hit of dopamine when we’re learning, and we are more effective learners. In spite of studies out there showing us that Facebook and Instagram make us feel worse because we start comparing, we could extrapolate that curiosity-driven social media interactions are beneficial and make us feel good. Yes, I just helped you rationalize that half hour you spent on Twitter earlier (and did the same for myself). Curiosity helps us learn stuff that we’re interested in, which is great. The fact that it can help with learning those things that we don’t find so interesting…that’s where I see the real grab here. What if we were to ask our learners, “What are you curious about today?” as a starting point for their learning? Not only could we use that to facilitate their skills as a life-long learner, we could also use it as a way to transition to information they may be less curious about but that we know is no less important for them to understand. It makes learning collaborative, it fosters adult learning, and it often generates excitement that makes the learning process far more fun for both learner and teacher. What are you curious about today? What if it’s not our fault? In the last week I have found myself in the midst of two interesting Twitter conversations, both with a similar underlying theme regarding the impact of culture and how we seem to underestimate its impact on the individual. I particularly loved the empathy behind the idea that the term burnout implies that it’s a personal choice. While we’re getting smarter about identifying organizational factors that drive burnout (ahem…my group’s call schedule), there still seems to be this idea that if you’re struggling with burnout, you’re simply not resilient enough. Reality check: I’ve witnessed some people who are remarkably resilient struggle with burnout, and without exception they have been in a work environment in which they had little to no control. Yes, I understand that individual characteristics may predispose people to burnout or may limit the impact of a dysfunctional system upon the individual…but at the end of the day, victim blaming and pretending it’s ALL about resilience? That’s simply feeding the dragon. It’s not helpful. So, maybe it’s not about biological clocks or because we’re not ambitious enough. Maybe, just maybe that ambition is situational…and that if we’re in an environment where we see other women hitting their heads repeatedly against the glass ceiling, or we experience that ourselves, we adjust our expectations accordingly. Or we leave when we realize that we shouldn’t have to adjust those expectations because there isn’t anything wrong with them. It’s time to stop telling us to try harder, or telling us that we can’t be mothers and academic surgeons, or telling us that we don’t measure up because we don’t know the 100 extra double-secret and unwritten criteria that you’re using to evaluate us. Most importantly, it’s time to create a culture in which we feel valued and supported, not because you tell us that we should, but because we actually are. What if it’s really not our fault? I admit that I usually try to give you food for thought then let you draw you own conclusions and applications. Get yourself a “Girl Gang.” If you are somewhere where one is already in place, find out how to become a contributing member. At all costs, though, find yourself a group of women who share your commitment to excellence. This article examining mentor-mentee sponsorship and gender came to my attention over the weekend (HT: Susan Pitt). 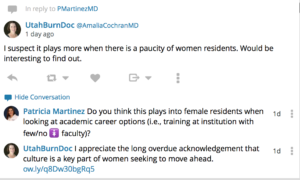 She astutely pointed out that this gives us an “action item” for women in surgery- to do a better job with sponsorship as more of us move into leadership roles. This came on the heels of my friend Harriet Hopf mentioning during a breakout session last Friday that she appreciated being asked to join a “girl gang” that we already had in place at Utah with the expressed goal of promoting one another for leadership opportunities and awards. She came here from an institution with plenty of women in her department and in leadership roles, so this wasn’t something instinctive for them to do. For those of us in departments and places with a paucity of women leaders, it’s critical. How does our Girl Gang work? It’s remarkably easy. We watch out for leadership positions or awards (both within and outside of our institution) that align with one other’s skills and accomplishments, and we nominate each another. Also, if there is a recognition that one of us really wants, we have an understanding that self-nomination to another group member is encouraged, and they’ll take care of the actual nomination. Certainly our effort focuses on a group of women who are at a certain stage of their career, and those people definitely comprise the active members of our Girl Gang. However, once you start doing these things for your peers, you realize that it’s easy enough to extend your influence beyond that core group. I suspect I’m becoming a bit notorious with some of our female faculty in particular for my “nudge” emails (“You are incredibly qualified for this…you should apply…how can I help?”). My basis for doing this is two-fold, and both are factual. First, as women we tend not to apply for things until we’re overqualified. Sometimes we just need someone to tell us that yes, we really are worthy. Second, it helps take the stigma away of tooting your own horn– again, something that women are penalized far more heavily for than are men. Although I usually don’t go clearly political around here, it’s happening today; since it’s time-sensitive, I interrupt your regularly schedule programming. Your February Reading Round Up will happen over the weekend, I solemnly promise. I’ve spent almost a week now pondering the Executive Order issued last week that limits entry to the US by residents of seven Muslim-predominant nations. When I first read about it on Friday, I immediately thought of two former medical students I mentored whose parents immigrated to the US from Iran in the late 1970s under terribly unfavorable conditions. I thought about a young Iraqi who we cared for during my time at Shriners as a fellow. And, of course, I started thinking about many, many immigrant stories of friends, colleagues, and my own family and the impact that blanket policies could have had on many of us. Of course, over the last week many stories have come to light. The first one I saw was on Facebook– an Iranian woman with a PhD from Clemson who went home to visit family, then couldn’t get back to her home in South Carolina. She astutely asked what happens to her car at the airport, to her house filled with her belongings, to her dog? That brought the immediate human cost home to me. Then there’s the story of this Sudanese physician, training at the Cleveland Clinic, who was in Saudi Arabia on vacation with her family when the Executive Order dropped. She is now suing. She is not alone in this. For those who don’t know, many foreign medical graduates come from the targeted countries, and many of them are delivering healthcare in areas where we simply can’t get American physicians to work. Not only does this affect that pipeline, it also may impact their willingness to come here in the future if it becomes easier again. Most importantly, it appears that the foreign docs we are attracting are the best and the brightest since Medicare patients cared for by IMGs have a better in-hopsital survival rate. The AAMC and the ACGME have generated thoughtful statements on the impact of this Executive Order on medical education and healthcare delivery. I particularly appreciate the ACGME for acknowledging the associated moral distress around the order; this has been an almost taboo subject, but it really shouldn’t be. This order has real human consequences on scientists, students, and residents; on patients; on families; and on the American healthcare system as it currently functions. What’s my point here? Simply that this Executive Order appears to have had plenty of unintended consequences. It wasn’t ready for prime time, and it became clear over the weekend that ICE and DHS weren’t ready for implementation. And my other point is simply that it’s easy for us not to know all of someone’s story and how they can be impacted by decisions that seem less-than-strategic when you look at all sides. I’m not going to make an argument for wide-open borders, but for us to be able to help people who are trying to help people…well, that seems like the right thing to do. It also seems, to me, to be relatively apolitical. This past week I attended the Society for Critical Care Medicine Critical Care Congress. Sure, the venue was a draw (Honolulu), as was the opportunity to spend time hanging out with my favorite pharmacist (Ann Marie is a rockstar and wonderful human). More importantly, I always leave this meeting feeling like it was time and money well spent. This year was absolutely no exception (and yes, Burn Unit colleagues…be afraid. I have at least 5 new and improved ideas for us!). One of the standout sessions was a 2 hour discussion of burnout in ICU providers. The session focused on physicians and nurses, and I’ll grant I would have liked more inclusion of information for our APCs, our PTs/OTs, and our pharmacists. In spite of that, there was a lot of great discussion around the topic; if you want to see what it looked like on social media, check out the #StopICUBurnout hashtag on Twitter. 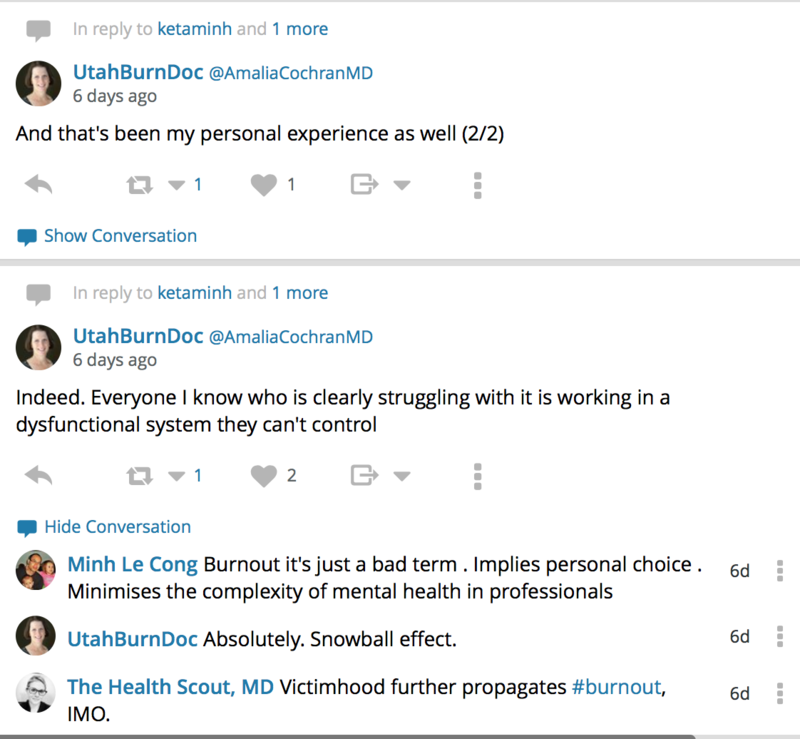 It’s clear that we need to take a team-based approach to burnout because of the impact on team dynamics (it’s contagious) and patient outcomes (it’s negative). Oh, and it also negatively effects our learners. Here’s the conundrum around burnout. A certain amount of stress can be positive and constructive under appropriate circumstances. Plenty of literature demonstrates that we adapt, both individually and collectively, with a certain amount of stress and that these changes can be for the better. The issue becomes when the amount of stress is simply too much and we can’t manage another thing. I’ve been there, and if you’re honest with yourself you’ve probably been there too. That’s when stress can become negative and maladaptive and push us into that “burnout” space. What if going for a run or going to yoga or doing whatever your “thing” is- what if that were actually helpful even when you’re heading into what I’ve referred to more than once as “the land of overwhelm”? Or…to ask it another way, how many times have you not done something that you know is good for your mind, soul, and body because you simply have too many other things to do? Again, yes, count me amongst the guilty. But what if that “one more thing” is actually something that really is regenerative for you? It might actually help you to become more productive and more focused. And if you’re a leader in your environment, by being authentic and engaged (and less stressed), you’re setting the best tone for your team to thrive as well. Try it. Let me know how it goes. I promise I’ll work on doing better with this as well.